Romans 12:1-7 1 Therefore I urge you, brethren, by the mercies of God, to present your bodies a living and holy sacrifice, acceptable to God, which is your spiritual service of worship. 2 And do not be conformed to this world, but be transformed by the renewing of your mind, so that you may prove what the will of God is, that which is good and acceptable and perfect. 3 For through the grace given to me I say to everyone among you not to think more highly of himself than he ought to think; but to think so as to have sound judgment, as God has allotted to each a measure of faith. 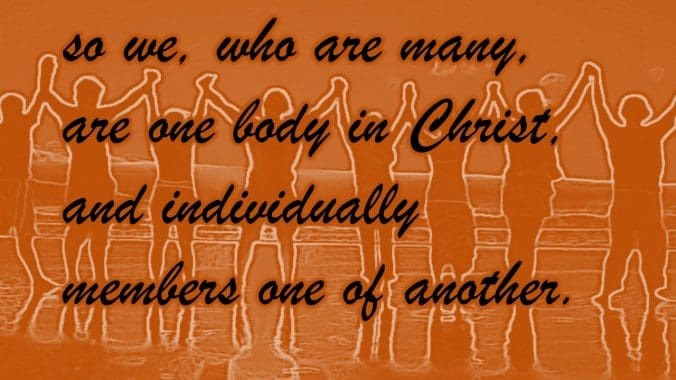 4 For just as we have many members in one body and all the members do not have the same function, 5 so we, who are many, are one body in Christ, and individually members one of another. 6 Since we have gifts that differ according to the grace given to us, each of us is to exercise them accordingly: if prophecy, according to the proportion of his faith; 7 if service, in his serving; or he who teaches, in his teaching; 8 or he who exhorts, in his exhortation; he who gives, with liberality; he who leads, with diligence; he who shows mercy, with cheerfulness. The human body is a great metaphor for understanding the church. It is a favorite metaphor for Paul. The body displays great diversity in functionality. It would be useless for the members of our human body to have all the same function, and the same goes for the church body. Even though the members of our body are different, they are unified. Our face, forearm, fist, finger, femur, and fibula all very different but all joined together as a part of the body. Our face and femur don’t decide to stay home while our body goes to school. In unity, these diverse members of the body leave the house together and work together for the same purpose. The church is like the body. We all have distinct functions and we all are to be in unity with one another. The reason for our commitment to one another is so we may be of the same purpose; which is to glorify Jesus through the process of making disciples. If you are already committed to the local body, and think to yourself, “I need the body of Christ,” you understand the need to humble and present yourself as members of one another. You already know you need to be faithful and demonstrate a commitment to other members. To those of you who hear the Scripture proclaim the need for having a mutual commitment, be encouraged to continue. You help others and yourself to mature in Christ. You make being a member of the body of Christ a joy. Through fellowship in the Holy Spirit, we help one another experience a piece of heaven. In the trials and difficulties of life, we look to our left and right and have one another to share in our sorrows, to provide comfort and encouragement, and to give strength to persevere. This passage is here to encourage those who are members of one another. And, this passage is here to rebuke those who arrogantly live as an independent believer. Some are not part of a church because of a terrible experience. Unfortunately, Christians did not demonstrate nor teach you the beauty of being part of a community of believers. Christianity is not an independent journey. No part of the body grows apart from the body. The body does not exist for the member; the member exists for the body. The world tells us to have self-esteem and be independent. The world says a mature person is the one grown to the point where they no longer need others. Living without the acknowledging our need for the body of Christ is thinking conformed to the world. No one is such a spiritual giant they do not need the body. Romans 12:1-7 addresses those who do not participate in the local body as thinking far too highly of themselves. It teaches they lack sound judgment. Christian maturity is not independent but recognizes the need of depending on others. A wise grown-up Christian knows they need the body of Christ. Renew your mind. Transform your thinking from independence to dependence. Please, if you call yourself Christian, be obedient by presenting yourself as a member of the body of Christ. We care for you. If you are a Christian, you are missing out on a great deal of what God has for you. It is very sad to know you are struggling when you don’t have to. A lone ranger Christian is a lone You are missing out on God’s design. We are jealous. We are not jealous of your lifestyle but jealous for the church. We are jealous of what you are holding back from us. We desire your fellowship. We desire your input and your gifts. We desire to see your face and hear what you have to say about our Lord. We have imagination. Imagine how amazing church might be if everyone were operating at full capacity. Imagine every person in this room who calls themselves a believer as being fully committed to one another. Imagine it. If we are all committed to one another with Christ as our Head, do you think God would be pleased? Would we bear fruit? It would be heaven on earth. Thank God for Christ the head and thank God for the body of Christ, the church.